Like certain spices in every rack, social networks have features that we simply pass over without giving them much thought. Sometimes we use them, but often as an afterthought with no strategy behind it. But these features were carefully thought out and built. They serve a purpose, a place in a recipe that many of us simply haven’t discovered yet. Here are some often-ignored features of major social networks, and how you can use them to actually benefit your social media efforts. While calling Twitter’s Favorites feature neglected might not really be accurate, this feature has a wide variety of at times unnecessary uses. It is often used as a quiet means of acknowledging a mention, when an @ reply would go a long way to thanking a person and potentially earning a new follower. Others favorite a Tweet as a means of acknowledging its quality without sharing, either because its racy or just not quite good enough. This is flawed, though, since you are actually sharing the message anyways. Favorited Tweets are public and may soon even appear in followers’ feeds. Put simply, favorites have become an undervalued afterthought, and those Tweets are forever ignored after that star is initially pushed. But they can be so much more than that. To real get value out of your Twitter Favorites, use them as a tool for research and content curation. Create a stream within Hootsuite of all your Favorites. Then only favorite Tweets that you think you or your followers might learn from, find valuable or interesting. When you have the time, go through these posts and see if they really provide value. Only after reading content should you share it. Don’t fall into the trap of sharing based on the headline alone. 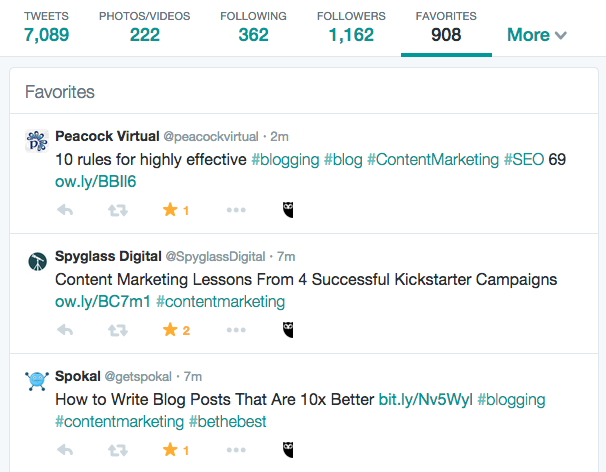 Using Favorites like this will help you curate only the best content, which your followers will appreciate. Your Favorites will also become a pool of valuable sources that you can cite and reuse within blog posts and other copy. Many people aren’t even aware of this feature’s existence, let alone making good use of it. Facebook interest lists are a means of organizing content you’re interested in that you don’t necessarily want clogging up your news feed. If you work in social media for examples, you can create a list of publications and specific journalists that report on tech trends, and then check in to see public updates from their page or profiles. In addition to being a great way to categorize your Facebook interests and create a smoother, more efficient experience, this saves you the hassle of having to Like multiple pages, and then having a newsfeed flooded with their updated (though occasional updates from your interest list will appear in the feed). This also should prevent your friends from seeing everything you like, and suffering through targeted ads based on those likes. 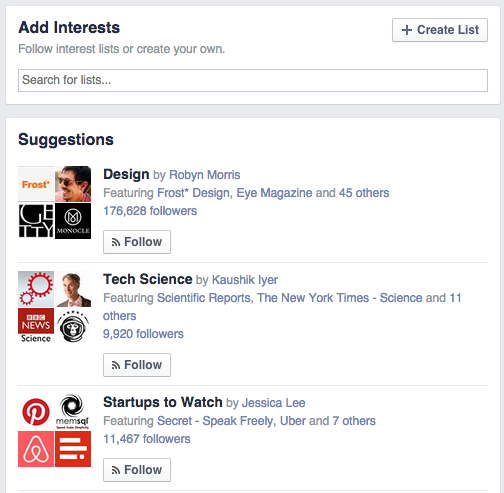 To create an interest list, click on the interests button in your left hand Facebook menu. From the interests page. Click the “add interests” button and then chose the “Create list” option. Search for people and pages to add, name your list, choose privacy settings and then click “done.” You can also follow existing lists and add pages to your lists as you browse Facebook. For more on Facebook interest lists, click here. 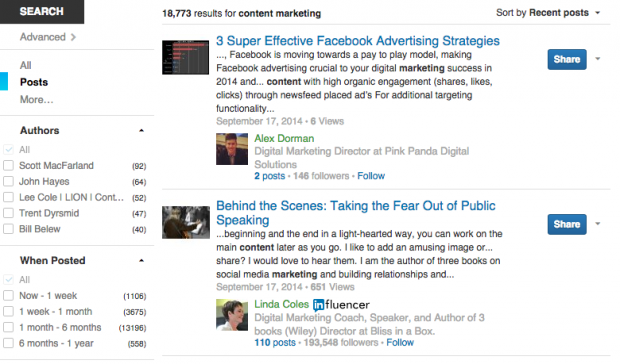 In the last two years LinkedIn has become a great tool for content marketing. From its thought leadership program to the LinkedIn publisher, more and more users are turning to the social network to find content and share their own. And yet, most people only see the content suggested for them on their homepage. We see content from people we follow, people LinkedIn Pulse thinks we should be following, and the “related content” attached to posts. 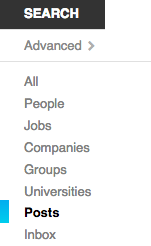 So few people are actually using one key LinkedIn feature: the “search for posts” functionality. About twice a day, LinkedIn Pulse suggests I read some post about common resume mistakes (hint hint?) but I’m much more interested in content marketing. So, to instead of waiting for content marketing posts to appear on my home page, I click the “advanced” button beside the search bar. In that new page, there is a sidebar on the left hand side that offers you the ability to search for posts only. Click it, type in your search term and then hit “search.” You’ll probably end up with a bunch of results by the same person, so you’ll want to adjust the search to show results by recently posts instead of relevance. Once you’ve got a hang of the search, you can check in daily for content that is relevant to you and your interests, and be the first to share it with your followers. 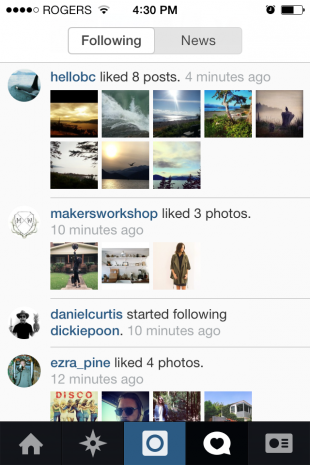 Most Instagram users, from the casual browser to the most social of businesses, have a routine. It often involves adding a photo, scrolling through the home feed, maybe exploring random user photos and checking their likes and mentions. Strangely absent from this list is seeing what the people they follow are up to. This functionality, found under the “following” tab in the news section of the app (the heart in the speech bubble), is almost invisible to a majority of Instagram users. People are often surprised to see it exists when you point it out. Yet, this feature can actually provide significant value, especially if you’re trying to gain a following on Instagram. The following tab shows you what photos the people you follow are liking, and it shows you who they are following. Essentially, then, this tab is a folder of examples for you to follow. You can see what style of photo gets the most likes and mimic it in your shots. You can see what types of accounts they follow and get inspiration from those sources. The following tab is a fantastic source of insight that is not to be ignored. We’ve all heard about how using Google+ can benefit our SEO rankings in Google, and we’ve all dealt with needing a Google+ profile to use YouTube. But the place of Google+ in the broader Google ecosystem offers an interesting opportunity when it comes to analytics. Under the “My Business” tab, Google+ Page owners can actually see their Google+ insights right alongside their website analytics. This means you can see your Google+ Page view growth, follower growth and engagement in the same space as your website page view and visitor growth. Why is this quick analytics snapshot valuable? These metrics are a quick way to identify trends between your social media success and your website success. If your Google+ following is trending upwards but your page views are flat, maybe you’re not doing a great job driving your social audience to your online assets. If the reverse is true, maybe the social sharing functionality on your website needs some improvement. It’s not the most comprehensive analytics tool, but it is a great, fast way to gauge whether you’re on the right track online. If the primary website listed on your Google+ Page is the same website you track using Google Analytics, you’ll be able to see this feature under the “My Business” tab. To learn more about connecting Google Analytics to Google+, click here. Want to learn more about these major social networks? Check out Hootsuite University’s Introduction to Social Networks.